While it’s true that many organizations background check their employees solely due to contractual or regulatory obligations and thus view it purely as an expense, many others view background screening as a way to build competitive advantage by reducing turnover, improving quality of hire, and mitigating human capital-related risks. Because of this, any organization can quickly start to question… is it really worth it? How much actual dollar value does a background screening program deliver? We recently set out to answer the question of Return On Investment (ROI) in background screening. Are the more than 90% of American corporations that rely on employment screening incurring an expense or are they making a smart investment? HR professionals and company accountants understand that turnover costs money, but how much? Researchers estimate the cost to replace an employee totals anywhere from 30% to 150% of an employee’s annual compensation. Hiring the wrong people increases turnover rate and sends those costs straight to the bottom line. From asset misappropriations to corruption schemes and fraudulent statements, occupational fraud is a costly form of theft. According to the Association of Certified Fraud Examiners 2012 Report to the Nation on Occupational Fraud and Abuse, the typical organization loses 5% of its revenues to fraud each year, with a median loss of $140,000. Small business suffered the largest median losses, attributed to the notion that they have fewer anti-fraud controls in place. Catastrophic events include workplace violence, sexual harassment, and accidents that occur due to falsified qualifications or alcohol/drug use. Compounding these events are the resultant law suits and negligent hiring litigation that nearly always follow on. Based on estimates from the Workplace Violence Research Institute, SAMHSA, and others, it is estimated that catastrophic events cost the U.S. economy about 1.3% of GDP. In total, we found that the business losses that can be reduced by background screening – including turnover, theft/fraud, and catastrophic events (and their resultant legal losses)—add up to over $1.5 trillion annually. When this data is compared against total business revenues (GDP) and applied to an “average” company, we estimate that 13.4% of all revenues go into a company’s “waste bank”. The model we have created below is based upon the work and formulas derived by Charles Handler, Ph.D. and Steven Hunt, Ph.D. This model captures and quantifies the various components that cost companies money by hiring the wrong employees. Included in these calculations are the cost of employee turnover and the costs of catastrophic hires—employees who engage in theft, violence, sexual harassment, etc. 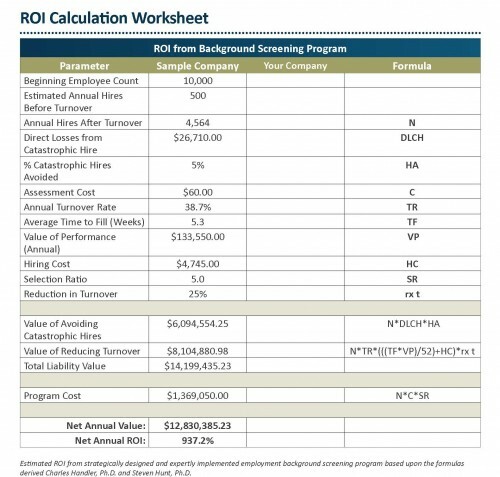 These costs, and the estimates regarding how much a strategic background screening program can reduce them, are then compared to the actual costs of operating a background screening program to arrive at an estimated ROI. According to the US Small Business Administration, for every dollar an employer invests in employment screening, the return on investment ranges from $5-16, resulting from improved productivity, reduced absenteeism, lower turnover—and decreased employer liability. Of course all of these numbers are reliant on having a background screening program that is run properly; meaning, it adheres to best practices at all levels. As this discussion of ROI proves, there is plenty of room for improvement in reducing the cost of a bad hire through employment screening. The starting point, however, must be the introduction of a strategic background screening program implemented by a highly qualified provider. 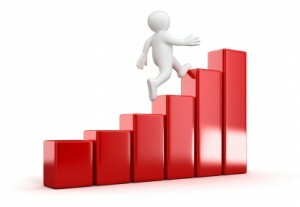 We invite you to discuss your screening program with our professionals. Request a consultation.